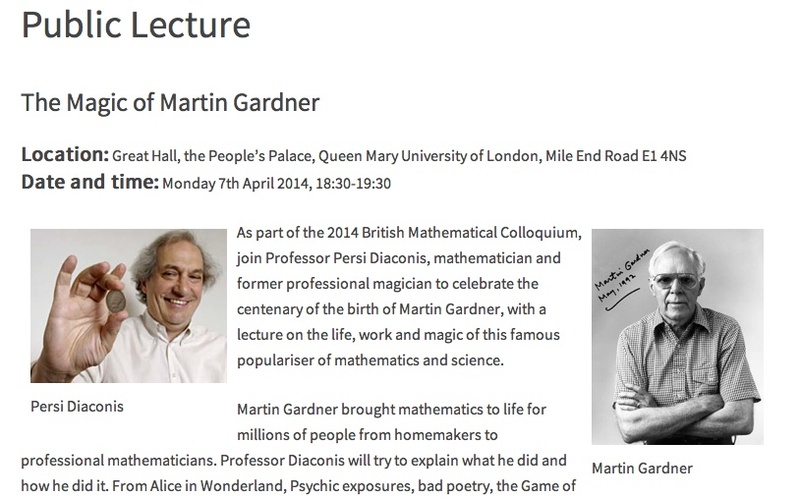 The name Martin Gardner is familiar to most mathematicians. He wrote numerous on mathematics from a culture and leisure viewpoint. (You can find his books on Amazon .) 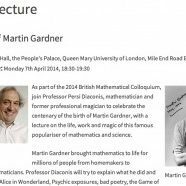 Next week Persi Diaconis will give a talk at the British Mathematical Colloquium (BMC) on the life and work of Martin Gardner. The BMC is an annual gathering of research mathematicians in the UK and beyond. Diaconis’ talk is a public lecture so anyone may attend but a (free) ticket is required. Details of the talk are here. I’ll be attending so do say hello if you see me. For all of those unable to attend but want to know a bit more about Gardner then Diaconis has co-written a biography of Gardner (as well as a great mathematical magic book) . There is also a recent article in the New York Times.